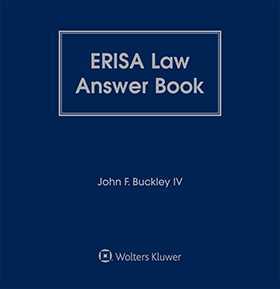 ERISA Law Answer Book is the practical desk reference that provides clear, concise, authoritative answers to more than 1,300 key questions - covering everything from benefit plan design, administration, communication, amendment, coverage, funding, distribution, and defense to fiduciary liabilities and litigation issues. It helps you ensure compliance with ERISA law...limit exposure to liability...avoid litigation...prevent plan disqualification...and make plan administration more efficient and effective. 8. Who Is a Fiduciary?